Members of the Suffolk County SPCA reflect on 9/11. The phone call came in the morning- NYPD frantically asking for our mobile animal hospital. Would we come to the city immediately? Please bring all available supplies and personnel. A disaster of untold proportions. Chaos and devastation everywhere. We set up our MASH unit as close to the site as we could. We grabbed medical supplies and climbed through the debris and falling ash to provide immediate first aid to the search and rescue dogs and their handlers. Our SPCA volunteers, as well as the veterinarians who arrived, responded without hesitation. They faced unspeakable horror and showed incredible courage, sacrifice and patriotism. 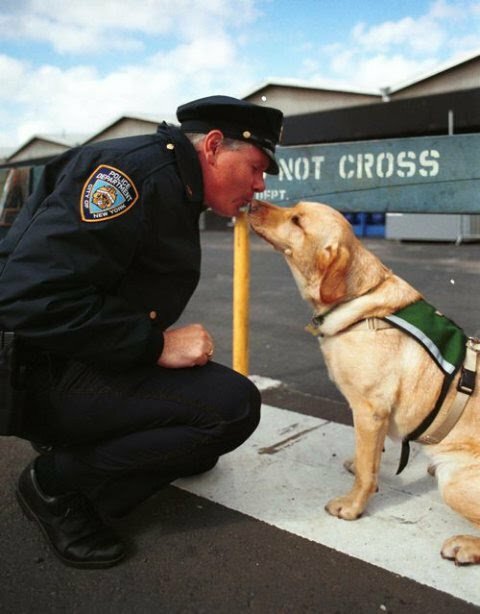 All kinds of dogs responded to Ground Zero-all shapes, sizes & breeds and with various job descriptions including search & rescue, cadaver, bomb dogs and even comfort therapy dogs. Some of the ailments suffered by the dogs were severe dehydration-they had to be rehydrated intravenously. We provided booties for their paws that were cut up by the sharp debris or burned from the smoldering ruins. Their eyes had to be irrigated with saline solution because of pollutants in the air. Their ears had to be cleaned-their bodies washed and decontaminated-cuts had to be sutured, scrapes and abrasions attended to. Yet they endured and kept on working like the true soldiers that they are. During the grueling 8 weeks that the Suffolk County SPCA was at Ground Zero we provided almost 1,000 treatments to the more than 300 courageous K-9's that came from all over the country. We even provided first aid to their handlers. We also helped civilians retrieve their pets from the evacuated apartments. Our peace officers escorted them from Pier 40 to their homes, brought them to our MASH unit for medical evaluation and returned them back to Pier . The Suffolk County SPCA was called to duty early on September 11, 2001. After receiving a call for assistance from the NYPD K-9 unit Chief of Detectives Gerald Lauber went into action by coordinating the response for the agency. The major part of the support provided by the SCSPCA was to be temporary veterinary support for the K-9 SAR dogs at ground Zero. The SCSPCA was tasked with developing and implementing a plan that would support the hundreds of SAR dogs and handlers who responded to the tragedy at ground zero . After five days the VMAT team arrived at our operations center on West Street. The SCSPCA had ten fully functioning work stations each supported by a veterinarian and at least one vet technician. Medical supplies were in place and all aspects of medical care were provided for both the K-9's and their handlers. The commander of the VMAT team Dr, Barry Kellogg saw the functionality of the SCSPCA's operations and decided to operate in conjunction with the SPCA rather than on its own. As a result of this collaborative multi agency effort the SCPCA was able to provided 40 days of continuous service to the first responders at ground zero. The SCSPCA was the first humane agency in the nation to be responsible for the coordination and delivery of essential services for K-9's at such a major terrorist inflicted disaster area. Chief Lauber, along with prominent veterinarians like Dr. Cindy Otto, who pioneered national research on the effects of toxic exposure on SAR dogs a ground zero, collaborated on the seminal article that defined the field treatment for SAR dogs. The organizational visual tools used by Chief Lauber clearly defines the organizational relationships for command and control that must be in place prior to any response to a major multi agency response. Copies of the report are available by request from the Suffolk County SPCA. The dogs had a very important role in the rescue efforts at Ground Zero. A dog's sense of smell has been estimated to be at least one thousand times more sensitive than ours; they have as many as 220,000,000 olfactory cells, compared to a human's 5,000,000; while you might be able to hear something roughly 50-100 feet away, a dog can hear something as far away as a quarter of a mile, sometimes even further. Dogs are dedicated and motivated beyond the limits of exhaustion like no human could ever be. Subject: LongIsland.com - Your Name sent you Article details of "Suffolk County SPCA Remembering 9/11"